I’m just sitting down with a cuppa after a morning’s hard graft in the garden. My back aches, my arms are pricked by thorns and there’s soil under my fingernails. And what’s all this effort for if I can’t share it on my blog? 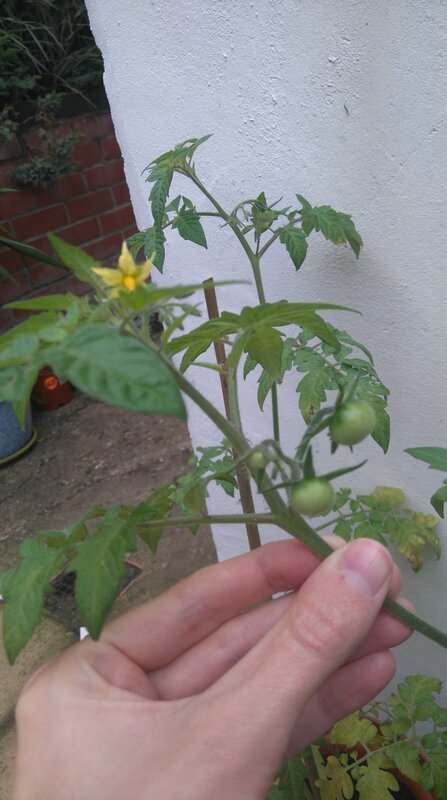 My tomato plants have finally decided to grow some fruit. I know I started them late and they’ve had a too tough time in the heat (too much sunshine, huh? You’re supposed to be exotic) but at last they have grown a few flowers last month and now this month the tiniest, teeniest little green fruits have started to form. Here’s hoping for a warm autumn to give them a chance to grow and ripen. Apples – the apple tree is blooming. 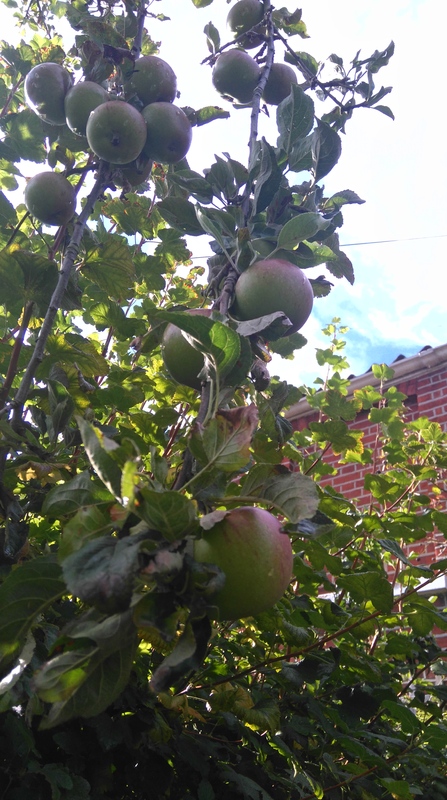 It looks like it’s probably an ancient tree (we rent a Victorian mill worker’s old cottage) and it always does well (too well; I can’t eat that many apples.) I couldn’t tell you what variety but they are slightly on the sour side. The pond: a toad moved in last month and he’s sticking around. 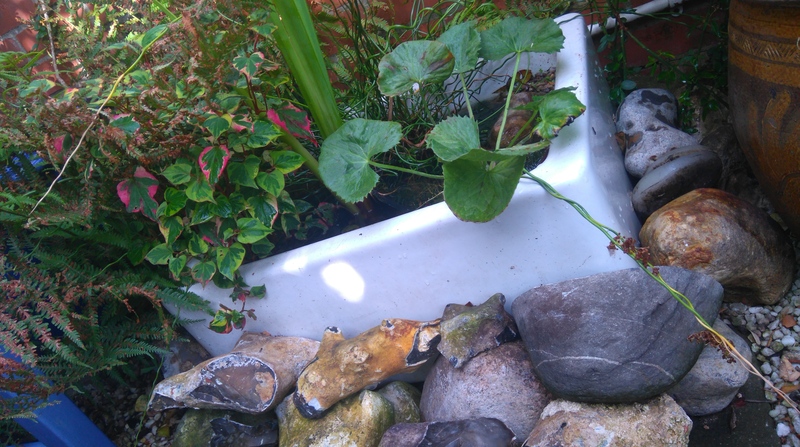 The plants we bought have grown too large for this small sink pond so one of them might end up getting chucked. So far the toad has escaped the clutches of my murderous cat. Tell me how your garden’s growing! We have some tomatoes thay self seeded themselves very late – those have only just flowered so you are not the only one! I have bigger plants but the tomatoes on those seem to have some form of rot. All trial and error but nice to see things growing. Gah, really? Rot! How annoying! The lack of control in growing and gardening is both glorious and frustrating. Yeh, it’s wonderful seeing things grow but sad when they turn bad. 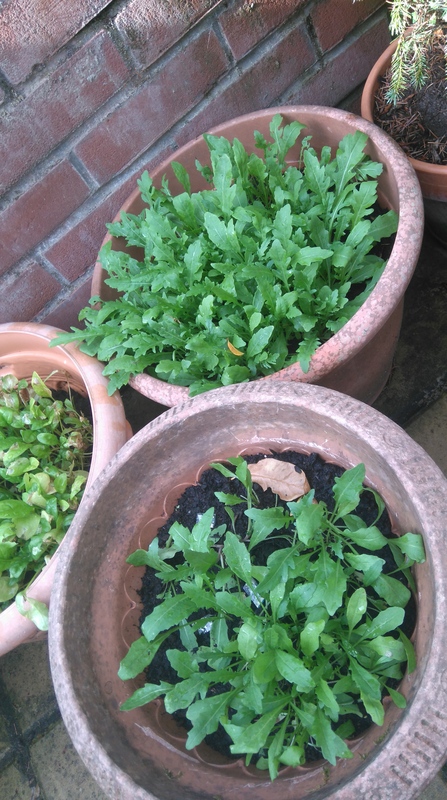 I think I may have watered over enthusiastically when it was so hot in July. Aw thank you! it’s good to see it all coming along. Ah thanks! That’s funny, it was my peppers that didn’t happen this year. you do your best but sometimes nature has other ideas and laughs at us! Hmm, guess crop rotation is encouraged…?